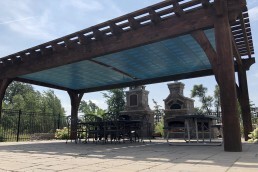 After lounging in the sun, a large pergola and retractable shade is a great way to find some UV relief. The combination can also dramatically enhance and define a space. 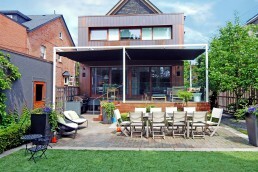 This outdoor project required much attention to detail, a challenge happily accepted by a few established companies. Through research, the homeowners decided that Oakridge Landscape Contractors was best suited for their revamp. They helped design and craft a landscape echoing the beauty of nature found just beyond the home’s fence line. Included in this process were hardscape, grand fireplaces, a blossoming garden, and a shade solution. 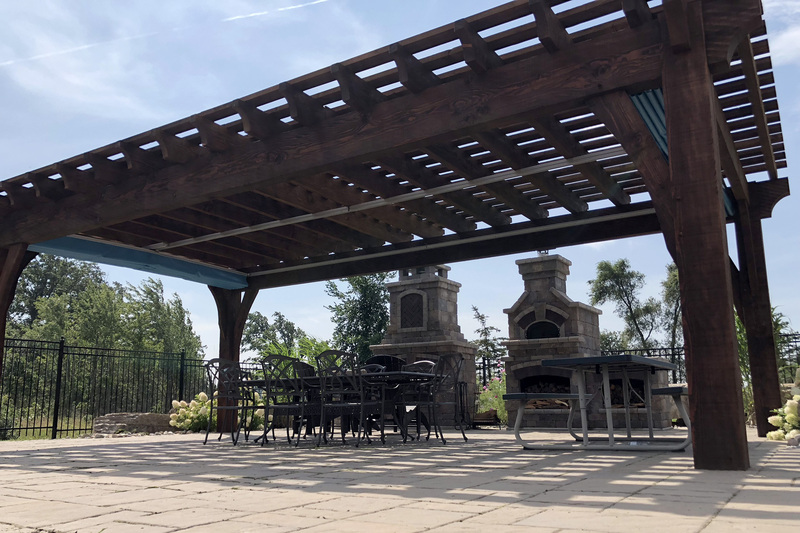 With a couple of sizeable fire features, it was only appropriate to balance them with a large pergola. Engineered for the Canadian climate, TimberKits customized a ‘Super Heavy Pergola Kit’. They build their products to withstand the elements and it worked great with this unprotected site. The homeowners requested additional protection in order to accommodate the profound changing elements. 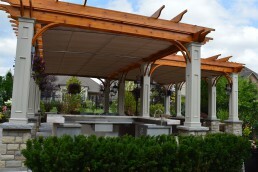 Oakridge Landscaping contacted ShadeFX and applied ‘Kissing Canopies’ using two 14’ x 14’ motorized canopies. Specified with a waterproof Ferrari fabric, it provides a thorough weatherproof solution. Furthermore, The canopy system had a Somfy Wind Sensor built into it. 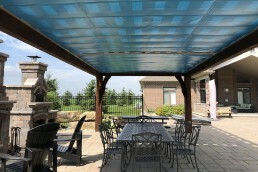 Even when the homeowners are not there, the canopies will automatically retract in those extra windy conditions. 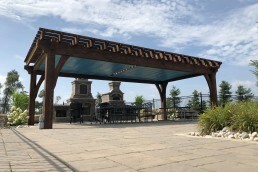 “The team at ShadeFX has met the demands of our client who required a two-canopy system for his custom pergola. From the first meeting on site, through the regular contact and prompt responses from the whole team, I knew we were in good hands. With the challenges of a very windy and exposed site, suggestions on material selection and installation methods led to a flawless delivery of the finished product. 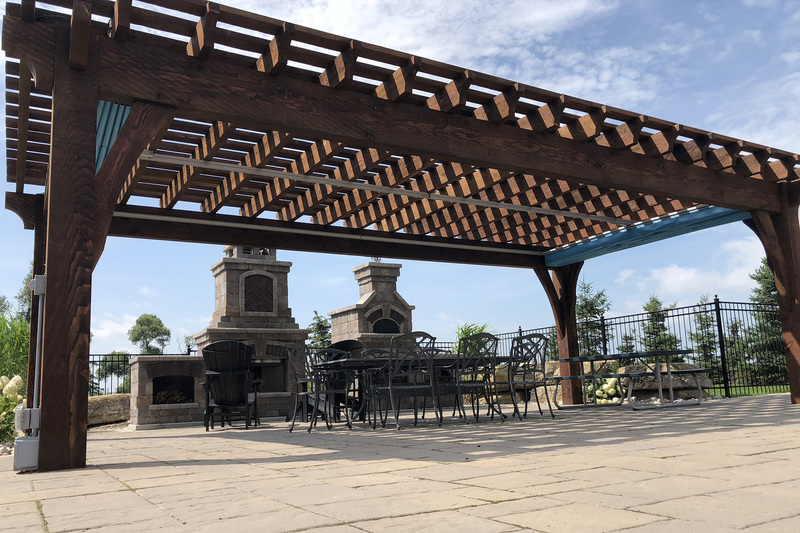 The custom large pergola blends effortlessly with the natural materials of stone and fir. Even more, the lagoon colored canopy adds a pop of color along with the flourishing garden and shimmering pool. 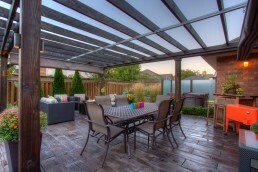 In essence, with great teamwork, this backyard has transformed into an impressive space for outdoor entertaining. No job is too big for ShadeFX. Contact us today. A Timberkit ‘Super Heavy’ Pergola and two 14’x14’ motorized canopies provide shade and rain protection in this high wind location. Lead by Oakridge Landscape Contractors, the shade solution exceeded the expectations of the homeowners.